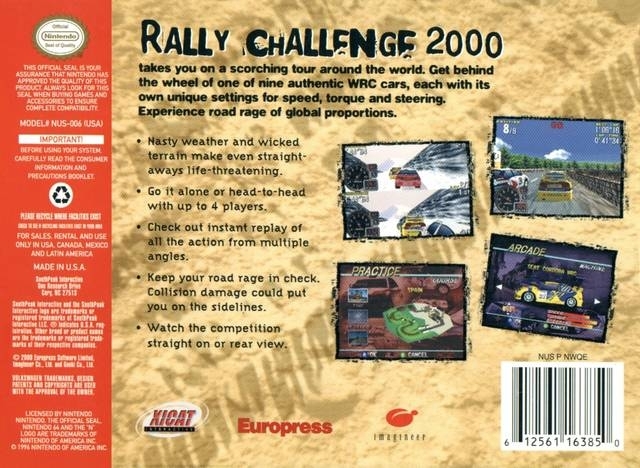 RALLY CHALLENGE 2000 takes you on a scorching tour around the world. Get behind the wheel of one of nine authentic WRC cars, each with its own unique settings for speed, torque and steering. Experience road rage of global proportions. Nasty weather and wicked terrain make even straightaways life-threatening. Go it alone or head-to-head with up to four players. Check out instant replay of all the action from multiple angles. Keep your road rage in check - collision damage could put you on the sidelines.